An increasing number of women and men are asking about injectable medications to address facial lines and wrinkles and restore lost volume to their face to achieve a more youthful appearance. At BAXT CosMedical®, in our New Jersey and New York offices, we are pleased to offer Juvéderm Voluma® XC to augment your cheeks and improve your facial contour. 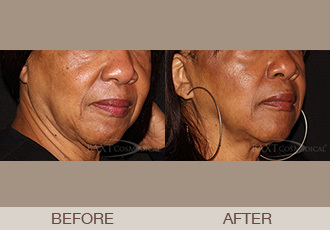 This next generation dermal filler is specifically FDA-approved for cheek augmentation. At BAXT CosMedical® Dr. Rebecca Baxt and Dr. Saida Baxt can assist you in selecting from a wide variety of dermal fillers that will best accomplish your facial rejuvenation goals. We invite you to schedule your consultation to determine if Juvéderm Voluma® XC, Juvéderm Vollure™ XC is right for you. Ask us how can achieve a “liquid facelift” with dermal fillers and BOTOX® Cosmetic! Juvéderm Voluma® XC is formulated with lidocaine that is FDA-approved to restore age-related volume changes in the cheeks. Similar to other fillers, Voluma® is a hyaluronic acid (HA) filler. HA fillers are made from long chains of sugars that occur naturally in the skin. Juvéderm Voluma® XC is the first FDA-approved filler for cheek augmentation. Why is Juvéderm Voluma® XC? Juvéderm Voluma® XC is effective in correcting what is called “midface volume loss.” As we age, there is a natural loss of volume in the cheeks. If you see that you have volume loss in your cheek areas and desire to have a more youthful appearance, Juvéderm Voluma® XC can help. BAXT CosMedical® was among the first cosmetic medical practices to offer Juvéderm Voluma® XC in the New York metro area. How Soon After My Juvéderm Voluma® XC Injections will I see Results? Both Dr. Rebecca Baxt and Dr. Saida Baxt advise their patients that Juvéderm Voluma® XC is an excellent filler to restore midface volume. Why Should You Select BAXT CosMedical® for Your Juvéderm® Injectable Gel Injections? Many women and men are interested in non-surgically restoring facial volume. It’s no secret that as we age our face loses volume and wrinkles appear. Interest has exploded in using injectable dermal fillers to address facial lines and wrinkles and restore lost facial volume to achieve a more rested and youthful appearance. Due to this demand, many physicians and nurses are taking weekend courses on where to and how to inject dermal fillers. But, should you trust your face to an injector with limited training? Would the wiser choice be to select a board certified dermatologist who has spent years of education and training specializing in the area of medicine concerned with the health and diseases of the skin and hair, nails, and mucous membranes? A dermatologist is a specialist who understands skin and facial anatomy. Dr. Rebecca Baxt is a certified Allergan trainer to teach other doctors best practices for injecting BOTOX® Cosmetic and fillers. board certified dermatologists who are expert injectors.